Our high tensile Ring Lock system is custom built and engineered to exceed industry standards, providing complete flexibility for a wide range of projects. Even with an emphasis on safety, industrial, institutional and infrastructure specifications are never compromised. High-rises are our specialty! Founded during the peak of the leaky condo crisis in Vancouver, Safetech has become the preferred supplier to many specialty restoration companies throughout the lower mainland. Our expertise in high-rise commercial and residential construction gives us an edge in low-rise projects. Experienced crews ensure projects stay on budget, without compromising quality and safety. Protecting your investment is our business. Our ability to span large areas with unit beams is a distinct advantage when creating sloped or flat canopy structures. Our new "kedder" roofing scaffold system provides an advanced engineered solution to your weather protection requirements. Whether it is lead, asbestos or chemical abatement, we are able to provide scaffolding solutions for containment and removal of hazardous materials in all confined spaces. Difficult access on projects are made easy with Safetech proprietary unit beams and accessories. Our highly trained and experienced teams are capable of getting you to isolated areas safely with ease, without breaking the budget. Typically an expensive endeavour in the past, Safetech has many options to meet your requirements. From light-duty to heavy-duty, we are capable of providing the simplest and most cost effective work platform solutions. Taking out columns are easy when you carry a full line of 10, 20 and 30 KIP frames and accessories. Post shores to 18 ft, aluminum beams and 4" x 6" timbers are always available. We can design, install and provide work procedures for any application. Custom solutions are always available with our trained and experienced installation crews. Sometimes frame or ring systems are unable to achieve what requires a specialty scaffold application. Safetech maintains a large inventory of tube and clamp scaffold equipment. Let us help you design a scaffold solution. Providing access to the top of the building, or getting out of an excavation, stair towers are a necessity on any site to provide safe user-friendly ways to move around. Safetech provides quality aluminum access towers that are cost-effective solutions. Moving materials safely can be as important as moving personnel. Safetech can provide plastic chutes for light-duty applications or for more extreme demolition projects. We offer a variety of options for hoisting and lifting on the job site. Proper hoists for the application are a necessity on all projects. From simple cable to heavy-duty rack and pinion hoists, we have a solution for all you needs. Mesh has become an industry standard on most projects, especially high-profile jobs. Aside from providing privacy, mesh is an excellent way to contain a site for safety, while maintaining a professional outlook. 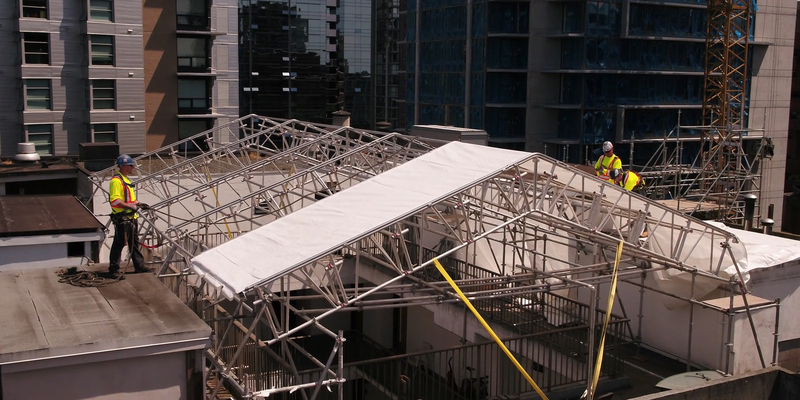 Frame scaffold, system scaffold, high-rise envelope, low rise envelope, roof canopies, containment, hangers and canteilevers, work platforms, temporary shoring, tube and clamp, stair towers, chutes, hoists, debris mesh, movie sets, hoardings and more.